For a long time there have been written a lot of different, books, articles and also there was shot a film about “Ashabi-Kahf”. We must say that the presented materials in the sources are mostly about the “seven fallen asleep” in Turkey and about some legends related to them. Excepting the minority of authors, “Ashabi-Kahf” in Nakhchivan is not researched properly at all. Publishing materials are mostly about legends, religions and mythical texts..
1. The formation of the legend about “Ashabi-Kahf” in Nakhchivan was for the first time spread among Turkish nations and then among the other folks. 2. The attributes of “Ashabi-Kahf” indicated in “Gurani Karim” is very similar with what is now in Nakhchivan.3. The cave is considered as an ancient fatherland; residential settlement before the “Ashabi-Kahf” accident and it was later called as a holy place. 4. Here the beliefs belonged not to other religions, but to the ancient Turkish belief system-to the national cult. 5. “Ashabi-Kahf” is the higher moment of slave’s appeal to the God, which is expressed, in the form of physical cleanness, spiritual concealment.6. 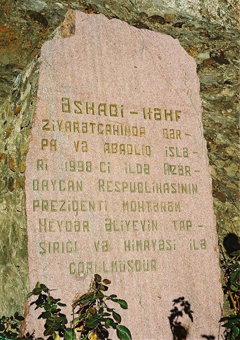 “Ashabi-Kahf” is the fatherland for the Azeri Turks who found a refuge in Nakhchivan caves for thousand years; it is also the identity passport engraved on cave’s stones. We believe that we shall repeatedly return to the issues similar to “Ashabi-Kahf”, to the one, which takes a slave closer to his God. The places like “Ashabi-Kahf” will also have the researches from all over the world together with multitude of pilgrims. The visitors who come to study “Ashabi-Kahf” together with their outer refinement they also protect their spiritual cleanness! Don’t forget! Allah is the one, who knows everything as it is.